We have a monster weekend of games in what has become a shockingly unpredictable and wild first round. Let’s take a quick spin around each series, focusing on some of the key questions — starting with the most intriguing series. The Thunder, a scoring powerhouse, are averaging just 101.9 points per 100 possessions through three games, a mark that would have ranked just 21st in the regular season. These teams have met in the playoffs three times in four seasons, and though the rosters have changed, it’s clear now that this is a difficult matchup for Oklahoma City’s predictable offense. None of this is news. The Thunder would surely like to go small more, with Durant at power forward, but they just can’t subject Durant to guarding Zach Randolph or Marc Gasol for long. The Thunder have gone small for about 39 minutes over three games, and such lineups are a collective minus-2, per NBA.com. Scott Brooks is going small whenever one of Gasol or Randolph rests, but the Grizz have done well over some of those stretches (Kosta Koufos took Durant to the post last night), and there are only so many of those minutes available. Brooks needs to be quicker to yank lineups when they stall out; it took seven minutes of unwatchable offense at the start of the third quarter last night for him to rejigger, and when he finally did, he swapped Nick Collison in for Serge Ibaka instead of Perkins. Both Caron Butler and Derek Fisher came in ahead of Reggie Jackson, and though Jackson has been miserable (he’s 3-of-19! ), he’s more useful than Fisher. Collison and Ibaka have played just 20 minutes together. In Brooks’s defense, his starters nearly won the game late for Oklahoma City, though Memphis was gassed. Dave Joerger might need to slot his bigs an extra couple minutes of rest, and I thought he went too long with the Tony Allen–Mike Miller combo. The Thunder don’t guard Allen (nobody does), and Miller can’t catch-and-drive off the bounce when the Thunder force the ball his way. It was also interesting to see Memphis go small for a bit, with Tayshaun Prince at power forward, against the Collison-Ibaka duo in the second quarter. That can be a way to goose the offense. Bottom line: The Grizz are going to squeeze the floor on Oklahoma City’s stars, and the Thunder offense has no backup plan once the first option fails. That leads to awful shot selection, especially from Westbrook, but Brooks will face an offseason reckoning if the Thunder bow out here. It would also raise questions about whether Westbrook and Durant can coexist. This team made the Finals two seasons ago, and Miami’s star wings had similar issues until the Heat found a way to generate much more space for them to work. But this is a potential powder keg. The most shocking series so far. The Mavs have junked things up on defense, slotting Shawn Marion on Tony Parker, hiding Jose Calderon on Danny Green, and switching a lot of pick-and-rolls. Those switches carry a cost — Parker dribbling around against big men — but they have gummed up the Spurs’ beautiful game. The Spurs are actually averaging about the same number of total passes and drives per game as they did in the regular season, per SportVU data provided to Grantland, but those actions aren’t really going anywhere. The Mavs are walling off the paint, sticking to San Antonio’s spot-up shooters, and inviting Parker midrangers and mismatched post-ups. About 21 percent of the Spurs’ possessions in this series have ended via post-ups and isolations, up from 13.7 percent in the regular season, per Synergy. They’re taking nearly four more shots per game within the last four seconds of the shot clock than they did in the regular season, despite averaging six fewer overall possessions. They’ve jacked just six corner 3s (shots that indicate good ball movement), below their single-game average in the regular season. What Dallas is doing to the Spurs is similar to what San Antonio did to Miami in the first part of the Finals: Drop everyone back, concede midrange jumpers, and do other unconventional things to kind of spook the other team. The Spurs’ machine has stalled. San Antonio must find something — earlier minutes for Ginobili as a secondary ball handler, more screening action, and more effective post-ups. Perhaps the Spurs could go small more, with Kawhi Leonard at power forward, when the Mavericks slide Marion to that spot. Then again, maybe we’re wringing our hands over nothing. San Antonio shot 10-of-20 from deep in Game 2 and would have been competitive had it not coughed up an embarrassing 24 turnovers. It would help if the vaunted bench would revert to form. 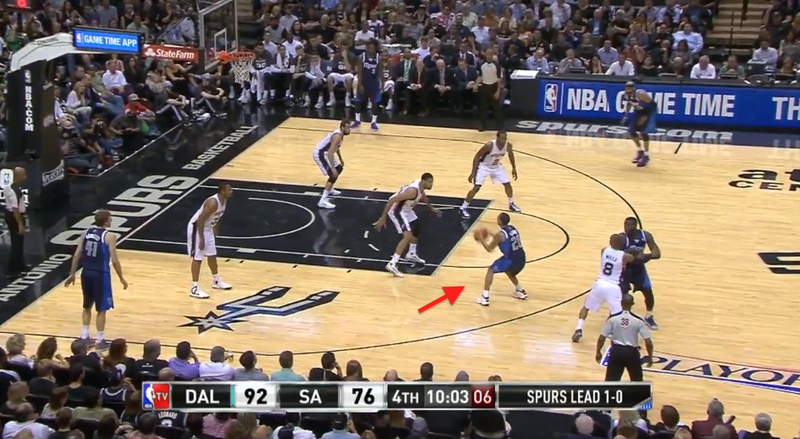 Devin Harris, long a Spurs killer, has been on fire. It will be interesting to see if the Spurs extend their big guys a bit higher, something they experimented with late in Game 2 — to largely bad results. Get into this series if you’re not already. Rick Carlisle is a warlock. Let’s nip this burbling narrative in the bud now: If Portland wins this series behind a hail of LaMarcus Aldridge midrange jumpers, it does not represent a triumph of old-school thinking over analytics. Portland was early on analytics and remains one of the league’s savviest stats-oriented teams; if you handed every NBA head coach the SAT math section today, Terry Stotts would probably be the favorite for highest score. Relying on Aldridge midrange jumpers in no way represents a rejection of analytics. It’s true that advanced stats have tilted the game toward 3-pointers and rim shots. Duh. You know who jacks a ton of 3s and limited opponents to the fewest corner 3 attempts this season? Portland. In a macro vacuum, minimizing midrange jumpers is smart. Basketball in real life doesn’t always work that way. Some midrange shooters, including Aldridge, are so good when unguarded that it’s a fine shot — especially against analytically oriented defenses designed to encourage that exact shot. But more that that, Aldridge’s midranger is the door opener for the juicier analytics shots. Portland’s other bigs get shots at the rim and offensive rebounds when their men rotate toward Aldridge. The Blazers get open 3s when teams send an extra defender at Aldridge’s pick-and-pops and post-ups. Dorell Wright had a thunderous dunk in Game 2 precisely because three different defenders were in some way involved in guarding Aldridge. Going small with Wright at power forward was a smart move by Stotts in Game 2, and highlights that Houston doesn’t really know what to do with its second big-man spot. Terrence Jones can’t guard Aldridge one-on-one, forcing the assignment upon Dwight Howard, which in turn takes Howard away from the basket. Omer Asik can do the job, but playing him alongside Howard cramps the floor on offense. The Rockets went super small, with Chandler Parsons at power forward, toward the end of Game 2, but that was mostly a desperation tactic — and something they might revisit when Portland downsizes with Wright. Donatas Motiejunas just sits on the bench, his perfect hair part intact. Jones could also punish Wright in the post if Houston stays big, though that hasn’t been his game. Portland has been laissez-faire about switching Damian Lillard onto Harden, and Harden has to feast on that instead of settling for awful step-backs. A bit more motion would open up Houston’s perimeter game; the Rox are just 1-of-7 on corner 3s so far, after averaging nearly seven such attempts per game in the regular season. Houston has been stagnant, and McHale’s substitution patterns have been occasionally strange — especially when he left Howard on the bench for so long down the stretch of Game 1, and then overreacted to Howard’s foul trouble in Game 2. The Rockets didn’t consider themselves title contenders this season — that’s next year, after a summer with the full midlevel exception — but a dispiriting first-round out will raise internal questions about McHale. They also need to tighten up their perimeter defense beyond Patrick Beverley — but we know that ain’t happening. When Toronto didn’t score directly off these plays, it snagged oodles of offensive rebounds; the Raps have rebounded nearly 36 percent of their own misses, a number that blows away what any team can manage over a large sample. The Nets are a terrible rebounding team, doubly so when opponents take Kevin Garnett and Mason Plumlee out to the 3-point arc. DeRozan isn’t on Lowry’s level as a pick-and-roll guy, but he’s gotten better, and more of this stuff might unshackle Terrence Ross’s outside shooting. Then there is the Joe Johnson question: DeRozan has no chance against him in the post (and has been bad in general on defense so far), and the Raps dusted off Landry Fields to take the Johnson assignment in Game 2. But Fields can’t shoot, and really doesn’t even want to, and it’s not ideal to give a long, reaching Brooklyn team a wing defender it doesn’t have to guard. If Toronto’s offense nose-dives with Fields, we could see John Salmons again (sorry, Toronto fans!). Dwane Casey might even experiment with using one of his bigs — Amir Johnson and Patrick Patterson, logging more time together than usual — on Johnson, shifting a wing player to Paul Pierce. This series has most closely resembled expectations, give or take some controversial calls and non-calls. The Dubs won Game 1 by putting Stephen Curry in pick-and-rolls and using the passing skills they have all over the floor to whip the ball around against an overaggressive Clips defense. But the loss of Andrew Bogut weighs more heavily each game. The screens for Curry aren’t dislodging Chris Paul, the L.A. defense behind the play has been cleaner since Game 1, and the Clippers are eviscerating Golden State underneath. Bogut had become Golden State’s primary Blake Griffin defender, and Griffin is just romping around in his absence. The Warriors have no real answer, but they need to try something else. Using Jermaine O’Neal sounds good in theory, but the Dubs’ starting lineup is an astounding minus-32 in just 34 minutes, and the strategy of having O’Neal shade away from DeAndre Jordan to sandwich Griffin just ain’t working. Trying Draymond Green in single coverage might work, and the Dubs probably need more Green in general. They’re plus-2 with Green on the floor so far, and plus-8 with the Green–David Lee combo. They can win this series only by spreading the Clippers thin. The Warriors have basically only scored well on Curry pick-and-rolls, but even those are dicey without Bogut’s nasty picks. The Warriors are right to at least try running Curry off screens away from the ball, and posting up Klay Thompson and Andre Iguodala against L.A.’s smaller guards — in moderation. The Wiz are lighting up Chicago’s defense even though the Bulls, as expected, have excised Washington’s beloved corner 3s; the Wiz are just 2-of-6 on such shots through two games. One example: Washington had its bigs act as if they were going to set high screens for Wall, only to stop near the foul line and just kind of stand there — an unfulfilled pick-and-roll. But Wall’s guy thought it was coming, and opened up his stance as Joakim Noah dropped deep into the paint. That pick sends Beal in the direction Chicago wants — toward Carlos Boozer and the sideline. But Gortat’s canny move gives Beal some space for a jumper. The Bulls will prep for this, and they can adjust by having their bigs take an extra step up — to cut off Wall earlier. They might also put Jimmy Butler or Kirk Hinrich on Wall, and hide D.J. Augustin someplace else in crunch time. Washington might start switching on some of these plays to contain the damage. Butler should be able to post up either Wall or Beal if the Wiz again have Trevor Ariza guard Augustin. Chicago needs to consider playing Mike Dunleavy more late in games. The Bulls badly need his shooting, and he should be able to check either Beal or Ariza. I mean, whatever. The Pacers at this point cannot even catch and hold on to basketballs, which is a pretty important part of basketball. In last night’s game, they were literally just dropping the ball out of bounds, throwing it to no one, and handing it off to invisible people. They’re scoring 99.6 points per 100 possessions through three games, a mark that would have ranked 28th for the season, and right around what they produced after February 1. An Evan Turner post-up on Lou Williams drew a double-team and would have produced a Roy Hibbert dunk, but Hibbert dropped the pass out of bounds. He is completely lost. But Indiana should look to post Turner and Lance Stephenson on every Atlanta wing save DeMarre Carroll, who is usually guarding Paul George anyway; Turner can’t really do much else, and Stephenson has attempted just two post-up shots in three games, per Synergy. Atlanta made some smart adjustments to the switching stuff Indy unveiled in Game 2, including more Kyle Korver, but the only thing that matters here long-term is Indiana’s complete offensive incompetence. It appears the East has lost a contender. Poor Big Al. The dude can barely move, to the point that when he lands after jumping for a rebound, he’s trying to come down on his one healthy foot. The Heat cruelly involved him in pick-and-rolls late in Game 2, snuffing out a Bobcats rally. The Bobcats are just overmatched, and they have no one to guard LeBron when Michael Kidd-Gilchrist — who was wonderful in Game 2, even as he killed Charlotte’s spacing as usual — hits the bench. Charlotte might want to get frisky and go super small, with three guards, Kidd-Gilchrist at power forward, and just one big on the floor. Hell, get really funky and use Anthony Tolliver at center in that alignment, at least when Miami goes small. The Bobcats haven’t done either of those things all season, but they’re desperate now — they already used a lineup in Game 2 that logged only one regular-season minute. And with Jefferson hurting, things aren’t looking good.